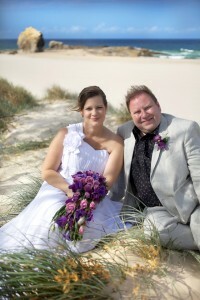 Just wanted to say a big ‘Thank You’ for the fabulous job you did on our wedding day. Trying to plan our Gold Coast wedding from overseas was not easy, but we had one less thing to worry about when you agreed to be our photographer. We were so happy that you were able to take exactly the kind of photos we wanted after only two short meetings. You did a wonderful job, battling the wind and making us look calm and relaxed, even if that is not exactly how we were feeling at the time :-) We received so many wonderful compliments about our wedding photos that it was a no brainer to ask you to take the photos of our daughter’s first birthday. You managed to capture her cheekiness and mischievousness perfectly even if she wasn’t the most obedient model! We are heading back to Australia shortly and hope you will be available to take some photos of our new baby daughter. Thank you once again!